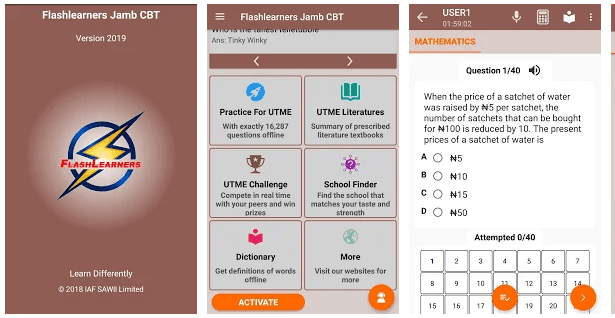 Flashlearners Jamb CBT 2019 is an e-learning Application that helps candidates prepare and pass Jamb without Runs or Expo. It works 100% offline (Without access to the Internet). It has numerous questions, text-to-speech technology, voice control and intelligent personal assistant. You can literally use your voice to move from one question to another. It is one of the most interactive CBT software in Nigeria. • 16,000 Questions Available Offline – practice authentic UTME past questions from 23 subjects with explanations. • Practice One Or More Subjects At Once – you can easily take more than one subject at a time. • Voice (Text-To-Speech) – you can listen to questions and explanation in an interesting way. • Voice Control – control next button, previous button, submit button and so on with your voice. • Built-In Calculator – use the built-in calculator to crunch numbers without leaving the exam interface. • Rich Result – get detailed analysis on how you perform on any exam. • Bookmarks – bookmark any question that you wish to view later. • School Finder – use School Finder to make smarter decision on what school or course to enroll. • All Subject Dictionary – get definition of terms from all major subjects with 92,000 terms offline. • Decide Everything – easily change the number of questions, exam year, exam time, exam mode and username. • No Subscription Fee – once activated, forever activated for all subjects! NB: Flashlearners is NOT in affiliation with JAMB. The questions are previous years questions and are meant to help you practice for the real exam. Please do not request for the actual questions because we do not have access to it and we will never make effort to do so. We encourage success through learning and practice; but strongly discourage exam malpractice. You may want to check it out, use the link below. It’s a wise decision and I’m sure you are going to enjoy it. Join the league of those who are already sharing their testimonies.